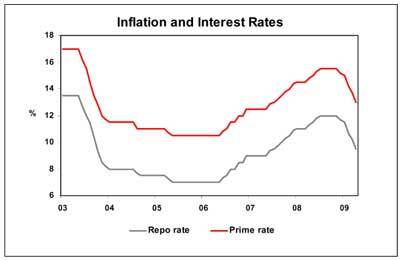 The Reserve Bank’s Monetary Policy Committee (MPC) cut the key monetary policy interest rate – the repo rate – by a further 100 basis points to 8,5%, effective from 4 May 2009. In reaction to this, commercial banks will be lowering their lending rates to the public, i.e. prime and mortgage rates, by 100 basis points to a level of 12,0% from the same date. Interest rates have been cut by a cumulative 350 basis points since December 2008. The MPC has analysed a wide range of local economic indicators, global economic conditions, as well as the expected outcome for the CPI inflation rate in the near term, when deciding on the way forward for domestic interest rates during the past two days. The CPI inflation rate for all urban areas was marginally down to 8,5% year-on-year (y/y) in March this year, from 8,6% in February, with the Reserve Bank expecting it to reach a level of 5,4% in the fourth quarter of 2010. The US, UK and Eurozone economies are forecast to contract by between 3% and 3,5% in real terms in 2009, while the Japanese economy is expected to contract by almost 6% in real terms this year. South Africa’s economy contracted at a real seasonally adjusted annualised quarter-on-quarter rate of 1,8% in the final quarter of 2008. A further contraction is forecast for the first half of 2009, based on data for a number of short term indicators released in the early months of the year as well as short-term prospects. In view of these developments, the economy is believed to be in a recession, which is regarded as two consecutive quarters of negative growth in real gross domestic product (GDP). The economy is expected to contract by a real 0,5% this year after growth of 3,1% was recorded in 2008. The residential property market continued to experience tough conditions in the early months of 2009, with nominal price growth in negative territory and prices declining in real terms since the start of the third quarter of 2007. Despite declining interest rates, the housing market is expected to remain under pressure for most of 2009 on the back of a poorly performing economy, impacting employment and consumer confidence and sentiment. 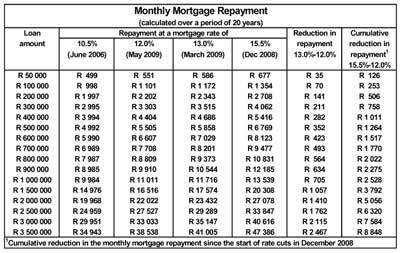 Although interest rates were cut by a cumulative 350 basis since December last year, causing mortgage repayments to be 18,7% lower as a result, they are still 10,3% higher than in June 2006 when the mortgage rate was at 10,5%. In view of the abovementioned developments and expectations, the residential property market is forecast to only bottom in late 2009 and to gradually recover during the course of 2010, largely driven by lower interest rates and expected better economic conditions next year. House prices are forecast to drop in both nominal and real terms this year.